After years of sluggish growth (and in several cases decline), many areas of the country are experiencing a thriving manufacturing sector. While the uptick we’ve experienced the last two years is definitely a positive thing, even those enjoying growth will continue to face challenges in the years ahead. We talk with manufacturers of all sizes every day and hear first-hand about the problems they’re dealing with. Their struggles are real, so we thought we’d highlight a few of the most pressing and provide insights into how industrial manufacturers can address them head-on. 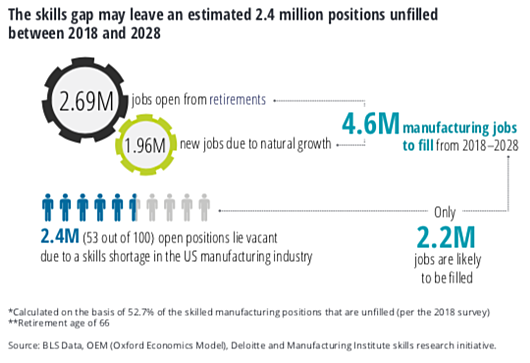 As Baby Boomers exit the workforce (and take valuable skills with them) and opportunities made possible by technology fuel growth, it’s expected that nearly 4.6 million manufacturing jobs will become available over the next decade – and nearly 2.4 million are expected to go unfilled. Today, 6 out of 10 open skilled production positions are unfilled. While automation and robotics may help fill the labor gap, skilled workers will still be needed to apply problem-solving capabilities, perform analysis and manage production. One reason manufacturers are finding it difficult to fill positions, both skilled and unskilled, is the lack of trade school opportunities for young men and women. To solve for this problem, many manufacturers are developing robust training programs to teach candidates everything from die making and welding to robotics programming and sheet rolling. Realizing that they need to be investing now to ensure they’re building a workforce for their futures, some manufacturers are taking it a step further, partnering with local community and technical schools to financially support trade programs and offer apprenticeships and internships that lead to full-time employment. Manufacturers also need to get creative in their efforts to attract workers by meeting them where they’re at today – not in the newspaper, radio, TV or billboards, but online. The more effective way to connect, especially with millennials, is through social media. Keep in mind that younger generations today aren’t looking just for a career; they’re looking for a positive culture focused on employee and community wellbeing. Use video to highlight the benefits of working for your organization, and promote your workplace culture as a primary asset. Automation, the Industrial Internet of Things (IIoT), robotics, cloud computing and more...technology is advancing at warp speed, and most manufacturers struggle to keep up, let alone stay on the leading edge. By the time many IT departments have gone through the process of researching, getting approval, purchasing and installing new technology, a faster and more agile solution may have already emerged. The Internet of Things (IoT) market is growing rapidly, with 3.6 billion connected devices used for daily tasks this year. In 2019, this growth is expected to continue. 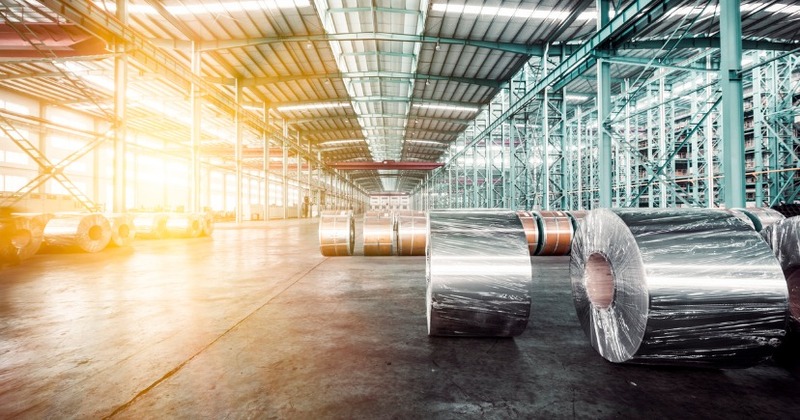 Fueled by 5G connectivity and advances in sensor technology, the manufacturing industry will see opportunities to drive growth by adopting IIoT (Industrial Internet of Things) devices to boost productivity, enhance product quality and reduce costs. As IIoT and intelligent systems are more widely used, there will be an associated surge in the amount of data manufacturers generate. What’s needed is the ability to analyze all this data. Enterprise Resource Planning (ERP) technology can help manufacturers manage volumes of data and formulate insights that lead to better decision-making. The best first step for incorporating useful technologies to help your organization grow profitably is to work with a business consulting firm that has expertise in manufacturing, such as Wipfli. These teams can help you make inroads faster, as they have the insights to assist in selecting the most practical, cost-effective technologies and equipment, oversee implementation, train your team, and help you get the greatest ROI. As technology advances, so do the efforts and skills of cybercriminals. While ransomware was once the most common form of cybercrime, after years of rampant growth it’s been overtaken by two “new” threats: banking trojans and cryptominers (according to Checkpoint’s Cyber Attack Trends: 2018 Mid-Year Report, miners affected 42% of organizations worldwide in the first half of 2018 alone). The majority of manufacturers are relying on outdated security systems incapable of addressing the number and complexity of threats today, leaving many of them vulnerable to costly breaches. Businesses need to employ more sophisticated ways of securing their networks, as the traditional firewall approach may not be adequate to keep hackers from accessing them and doing real damage. The best weapons for combating cyber attacks are ensuring that all computer security software is routinely updated, and educating employees about the warning signs that the company’s security is being breached. One common way cyber criminals get into your network is via email. One of our clients has a helpful list of clues that may indicate if an email is a phishing scam that you may find helpful in avoiding a breach that could be very costly to your organization. Today, according to the Global Manufacturing Competitiveness Index, the U.S. does not hold the top spot as the world’s most competitive economy; China has that honor, though it’s expected that we’ll take that spot by 2020. What it will take to get and hold that spot, according to a report by Deloitte, The Future of Manufacturing, are advanced technologies and talent – with talent being seen as the top driver for competitiveness. The report suggests that for manufacturers to be competitive in the future, they will have to shift production to higher value, advanced technology products and processes, in part to avoid price wars, and in part to make it possible to offer new product-as-a-service and service-based pricing models. Manufacturers themselves predict that by 2020, 47% of all their products will be smart, connected and capable of generating product-as-a-service revenue. One estimate suggests that if manufacturers accelerate their efforts to develop smart, connected products, the industry could add up to $685 billion in value by 2020. Traditional marketing efforts for manufacturers are proving far less effective than in the past; trade shows, trade ads and cold calls aren’t working like they used to. In the digital age, organizations need to do more than put up a website and hope that their best prospects will stumble across it. Industrial B2B marketers need to make a concerted effort to be found organically through online searches and provide a wealth of information that demonstrates relevance and expertise. That means they need to leverage inbound marketing and SEO tactics by creating content that provides answers to potential customers’ questions and problems. Robust manufacturing marketing strategies generate sales-qualified leads by building trust through relevant blogs, case studies, eBooks, infographics and other helpful resources. Once that trust is built through online engagement and leads are nurtured through the sales funnel, those leads are more likely to engage on a personal level by requesting a free consultation, demo, assessment or other offer from the company. Creating all that content takes time, and a high level of expertise is needed to make your organization’s content rank higher in search engine results. Enlist the help of inbound marketing experts who understand your pain points and are laser-focused on the manufacturing sector and you’ll be better equipped to meet these challenges head on. To learn more, check out our Inbound Marketing Guide for Industrial Manufacturers by clicking the link below. Then, reach out to us to start a conversation!